Bookride: Franz Kafka. 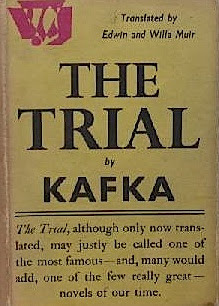 The Trial, 1925-1937. Franz Kafka. THE TRIAL. Victor Gollancz, London, 1937. Franz Kafka. THE TRIAL. Knopf, New York, 1937. Franz Kafka. DER PROZESS. Verlag Die Schmiede, Berlin 1925. Nabokov, sometimes grudging in his praise of other writers, described Kafka as "the greatest German writer of our time. Such poets as Rilke or such novelists as Thomas Mann are dwarfs or plaster saints in comparison to him." W.G. 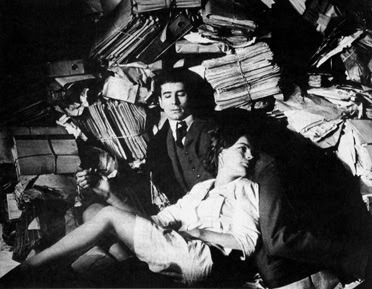 Sebald, in an interesting essay on Kafka's Jewishness (and also his moviegoing habits) states that there are more books about Kafka than any other writer. He is reviewing Hans Zischler's 'Kafka Goes to the Movies'--an interesting piece of forensic Kafka scholarship by the great Wim Wenders ('Kings of the Road') Godard, Chabrol and Spielberg actor. Sebalds's claim is possibly a Germanocentric exaggeration--Kafka must surely be in the top ten, but as a bookseller I have seen more books on Shakespeare, probably more on Joyce. Others in the top ten would be Proust, Byron, Virginia Woolf, Lewis Carroll, Rilke, Pound, Eliot and maybe the beloved Samuel Beckett. "Hardt, vielen Dank für das Telegramm; 'im Geistersaal' lesen Sie, heisst es dort, nicht ganz ohne Verstand. Nun so fern ich von Berlin auch bin, so fern doch nicht, dass ich von den Vorträgen nicht auch ohne Telegramm gewusst hätte, nur leider, nur leider, ich kann nicht kommen. Nicht nur, weil ich heute nachmittag übersiedelt bin mit dem ganzen Krimskrams der mächtigen Wirtschaft, die ich führe (die Übersiedlung war noch einfach genug dank der Hilfe der freundlichen Überbringerin dieses Briefes Frl. Recha Fertig) sondern vor allem deshalb weil ich krank bin, fiebrig und die ganzen Berliner 4 Monate abends nicht aus dem Hause war. Aber könnte ich Sie hier in Zehlendorf einmal sehn nach so langer Zeit? Zum morgigen Abend kommt ein Frl. Dora Diamant, um diese Möglichkeit mit Ihnen zu besprechen. Leben Sie wohl und Segen über Ihren Abend. K."
Wikipedia states that all Dora Diamant's letters were seized by the Gestapo in 1933, however, unless this tale is apocryphal, it appears some got away and also never got into the hands of dealers either. Fascinating! A question about the clutch of Kafka's letters given to the college. DO you know what college? The name of the ex-husband who had written the critical work? And the letter to Hardt which is sitting on ABE at £17K--where can I find that listing? Thanks very much. Fascinating is right. It's always rewarding having a stopover at Bookride and I only wish that my brain and time allowed for more frequent visitations. 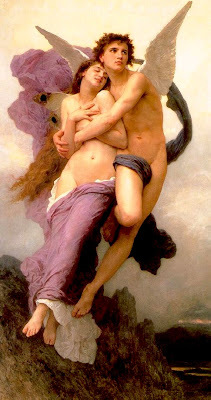 I quite like Bouguereau but at the fifty quid level--at $2million I say bugger Bougureau. By the way Stallone is not thick just dim.